Mahathir is moving closer to Japan, but he is not pushing China away. On November 2, Malaysia’s Finance Minister Lim Guan Eng tabled the much-anticipated Budget 2019 speech in parliament. After the Election Manifesto and the Mid-Term Review of the 11th Malaysia Plan, Budget 2019 offers the clearest indication of the Pakatan Harapan (PH) government’s policy direction. Major themes in the budget speech include strategies to alleviate financial burdens, encourage home ownership, and generate revenue through new methods of taxation. Another statement that caught media attention was the plan to issue “samurai” bonds in Japan. Samurai bonds are yen-denominated bonds that foreign entities can issue in Japan to raise capital. The Japanese government has pledged to guarantee $1.8 billion worth of 10-year Malaysia-issued bonds at an indicative coupon rate of 0.65 percent. Shortly after this was announced, Malaysian Prime Minister Mahathir Mohamad stated that the capital raised from these bonds would be used to retire loans taken by the previous Barisan Nasional (BN) government, which he believed were taken at exorbitant rates. The low interest rate accompanying samurai bonds is viewed as beneficial to Malaysia. If sufficient capital can be raised, then this would prove to be a cost-effective method to pay off older loans. In practical terms, the success of this strategy will be contingent upon whether investors have confidence that the bonds will yield an attractive return. A prospectus on the bonds has not yet been released, so this remains to be seen. The Malaysian government also plans to receive financing from Japan for infrastructure, transportation and human resource development projects. Japanese Prime Minister Shinzo Abe has also said that he was interested in reviving Japanese involvement in these projects. Thus, the samurai bonds announced in the budget are likely only to be the first tranche of bonds issued, and Japanese participation in Malaysia’s development projects looks set to increase. Mahathir chose Japan for his first trip abroad as prime minister. He has since made two further trips to Japan. In August, he was conferred an honorary doctorate from Ritsumeikan Asia Pacific University, while in November the Japanese Emperor presented him with one of the country’s highest awards for his efforts to build strong bilateral ties between Japan and Malaysia. Symbolism aside, it is no surprise that Mahathir views Japan favorably. Indeed, he was instrumental in pushing for closer relations with Japan during his first tenure as prime minister (1981 to 2003). Malaysian foreign policy observers have contended that his “Look East” policy was more Japanese-centric than East Asian-centric. This orientation stemmed from his fascination with the Japanese “economic miracle.” Mahathir’s well documented cultural essentialism predisposed him toward perceiving Japan’s re-emergence to be a function of the country’s work ethic. And it was his belief that Malaysia would achieve a comparable level of growth if its citizens emulated Japan’s culture of hard work. To mirror the “Japanese work ethic,” Mahathir believed it was important to create opportunities for Malaysian students to study in Japan. As such, the Malaysian government began a policy of issuing scholarships to encourage Malaysians to study in Japanese tertiary institutions, technical colleges, and training programs. Instead of defining bilateral relations purely on the basis of trade and investment, Mahathir also sought to develop leaders in the public and private sectors who were Japanese-trained. He hoped that, as a consequence, the norms, values, and skills they learned in Japanese institutions would, over time, diffuse into the workforce at large. Admittedly, the success of this policy is difficult to gauge. It is, however, interesting to note that from 1981 to 2003, roughly 10,000 Malaysians studied in Japan, while over 14,000 Malaysians enrolled in British universities in 2013 alone. This suggests that more could have been done to enable Malaysians to study in Japan. Perhaps recognizing this, Mahathir now looks set to expand the scope of education collaboration with Japan in his current term as prime minister. Education Minister Maszlee Malik accompanied Mahathir to Japan in August and November. He has since announced that three Japanese universities will open branches in Malaysia. Maszlee is also in the midst of implementing reforms to Malaysia’s education system, and it would not be surprising if he attempts to borrow from Japan’s systems of teacher training, curriculum development, and pedagogy to be implemented across different levels of education in Malaysia. Japan’s strategic importance to Malaysia cannot be understated. It is currently Malaysia’s fourth largest trading partner. Under previous prime ministers Abdullah Badawi and Najib Razak, Malaysia expanded cooperation with Japan in niche industries. These included halal tourism, halal food manufacturing, and Islamic banking and finance. After taking over as prime minister in May 2018, Mahathir spoke out against some of China’s investments in Malaysia, leading to speculation that Malaysia is keen to rebalance its interests away from China. Such a conclusion would be premature — China remains a key economic partner of Malaysia, and it has in fact been Malaysia’s largest trading partner since 2009. And the pragmatist in Mahathir would see little contradiction in criticizing some aspects of Chinese investment policy while also inviting Chinese investments. In his previous tenure as prime minister, Mahathir’s rhetoric was frequently anti-Western even as he deepened trade with the West. 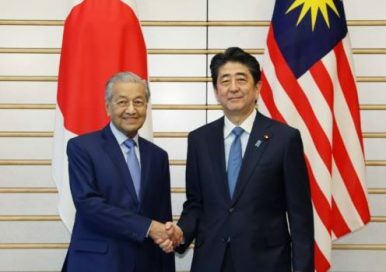 Mahathir’s moves to expand the possibilities of cooperation with Japan are primarily driven by his desire to secure tangible economic and human capital benefits from a country that he has long admired. It will also allow Malaysia to diversify its sources of foreign investment, creating more space for it to maneuver in an increasing uncertain world. Prashant Waikar is a Research Analyst in the Malaysia Program at the S. Rajaratnam School of International Studies at the Nanyang Technological University.